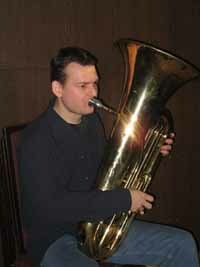 He has studied tuba since he was eleven in music school "Josip Slavenski" in Novi Sad in the class of professor Dubravko Markovic. He finished high school majoring in Musical Theory and continued working with prof. Markovic. Academy of Art in Novi Sad he finished in the class of prof. Branislav Aksin, and at a moment he attends graduate school in the class of prof. Aksin. He had five solo concerts and he has received a number of awards for solo playing, chamber music and orchestra playing. He currently works full time in Belgrade Philharmonic Orchestra, and he is also a member of Serbian National Theater in Novi Sad and Vojvodina Symphony Orchestra. He had various national as well as international performances, and has recorded a few cd albums.